I was on a birding trip with a friend last week at the Tamil Nadu-Kerala border. While good weather played truant, the birds certainly didn’t. I was lucky enough to see some for the first time. There were a few scares too. We had to climb a tree to escape an enraged Wild Boar. There was yet another Indian Gaur incident. And a storm had us holding onto our dear lives. Like Dickens said, “it was the best of times, it was the worst of times”. Except that even the worst of them wasn’t all that bad. On day one I went to the Periyar Wildlife Sanctuary in Thekkady. It was a Tuesday and there were few tourists around. 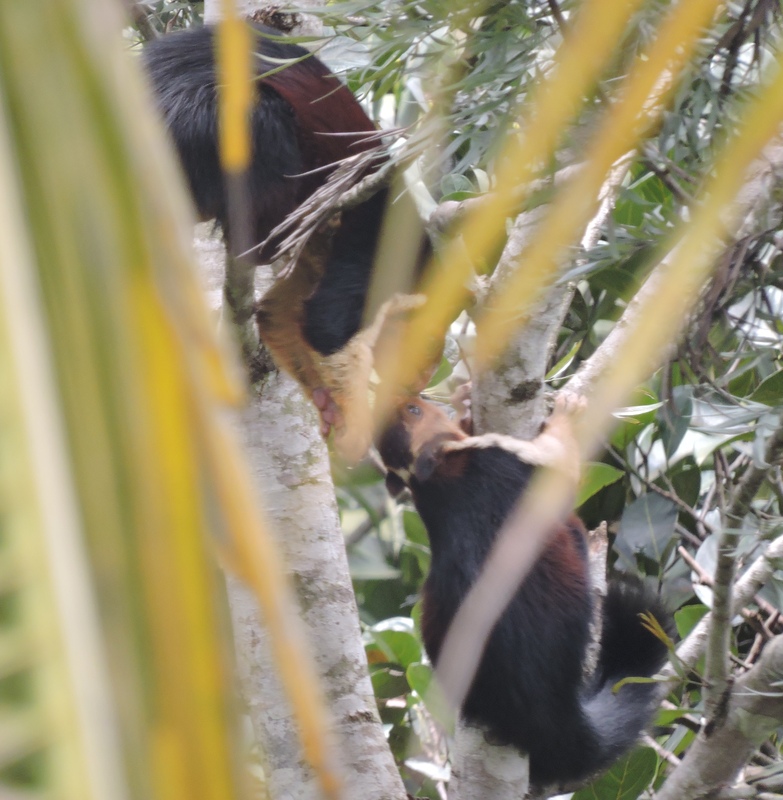 But there were two Malabar Giant Squirrels kissing outside my room’s balcony. A herd of Sambar Deer scourging for brunch. And Nilgiri Langurs filling the air with their cautionary ballads. As for the birds, Vernal Hanging Parakeets were the first to show up. They were followed by Chestnut Starlings, Pomphadur Green Pigeons, Nilgiri Pipits and Greater Flamebacks. As the light of day disappeared, I spotted a Rufous Babbler. I had seen her just once before. This time her plumage looked a little different. It was as though her overcoat was sun-burnt to perfection. I next visited Gavi – a tiny fauna-friendly village in the town of Idukki. It had been in the news this year because of an elephant attack. We rode through its pristine grass hills on a two-wheeler. It was exciting until it started to pour wild dogs and jungle cats. That’s when it became scary. Clouds of mist enveloped every trail in sight, and the muddy road we were on felt like death-traps. And the wind howled mercilessly. We were expecting to run bike-first into an elephant at every corner. The greenery though was just spectacular. I think I saw it once in a daydream without the dark overtones. The evening was far kinder. I saw so many Plum-Headed Parakeets that my eyes were hurting in the nicest possible way. A Chestnut Munia bathed in front of me, leaving me embarrassed and ecstatic. Her relative – a Black-Throated Munia – came over to say hello. 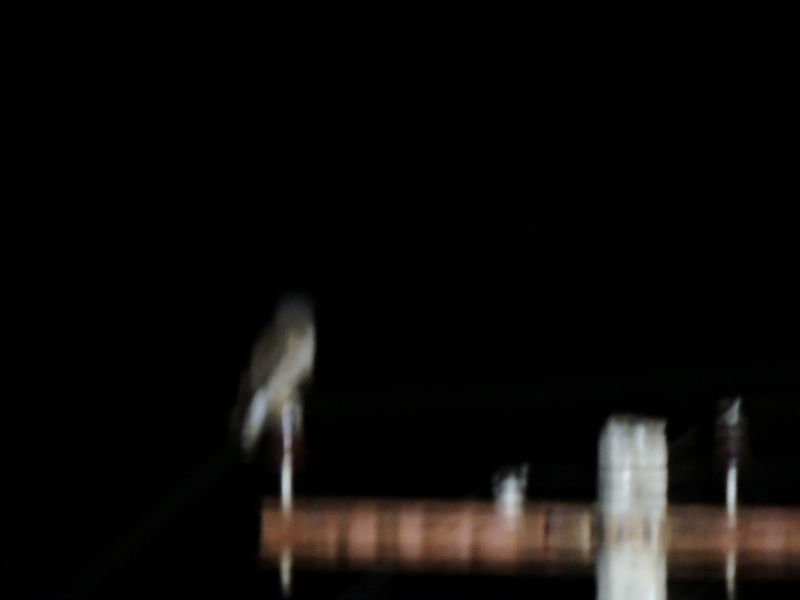 And two Common Kestrels reminded just how much I miss seeing them back home. I spent the last two days in the foothills of Kumily, and Megamalai – a misty mountain range nearby. I went on a night birding trail for the first time. We were on the look-out for Nightjars. Instead a Brown Hawk Owl set my heart aflutter. I only have a crappy photograph to show for it, so you must take my word for it. She looks like she belongs in a song. Towards the end, we had some scary moments. While searching for Jungle Owlets, we heard creaking noises from the denser side of the trail. Finally we realized it was an Indian Gaur as she approached us in an open field. 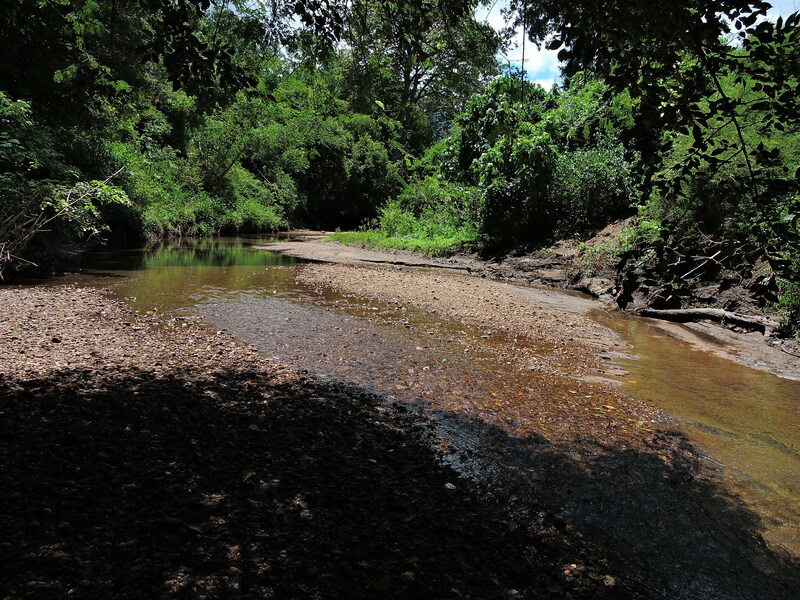 We quickly retreated into the forest, and power-walked through a muddy stream to escape an attack. A herd of wild cattle is far less dangerous than one on the loose by herself or just with her calves. Wet and paranoid, we were heading back. About a kilometer short of the cottage, I stopped to take a break. Seconds later, I saw my friend – with a terrified look on his face –run towards me. My brain immediately told me it was an elephant attack. And I ran uphill as fast as I could. My friend did too. We found a tree to climb to our safety. Then I saw the beast below. It was the angriest-looking tusked boar I had ever seen. Thankfully the local dogs heard the commotion and came over to chase him away. Also, the Jungle Owlet showed up to give me neck cramps and a lot of love. I had an encounter with an Indian Eagle Owl too. It wasn’t difficult to find her since she has been nesting in this particular location for years. But she just keeps looking more and more magnificent every time I see her. To top it off, I saw the Forest Wagtail, the Large Grey Babbler and the Pygmy Brown-Capped Woodpecker for the first time. “It was the age of wisdom, it was the age of foolishness, it was the epoch of belief, it was the epoch of incredulity”. Indeed it was. More importantly, it was a set of experiences I couldn’t deny myself – no matter the consequences. for sale in my soul. I wouldn’t mind being there myself! Nice work! Thank you! If you ever get the chance, you really ought to, comrades. Giggles. Never seen a wild dog / cat. If I do, I ll burst into happy flames and pieces of Roman candles. And bless your heart for fluttering to the songs of these winged beauties, GB. You should! Just give it a few more weeks until the rain goes away. Post monsoon kerala is ethereal! South India has wings and how !!! Such lovely shots (AGAIN !!) and you make me want to take off at the earliest. I still have Kodaikanal on my list after reading your post . Now , I think I have to get revisit Kerala , if not for anything else , just to see a few of the beauties in real that I have seen through your lens . Am so envious C .
Thank you so much P, those were such lovely things to say! And do plan a trip around November or December. Might I suggest Thattaekad Bird Sanctuary. Your posts are inspiring in more ways than one . I will plan a trip and am taking your suggestion seriously . Birdhouse for sale in my soul!! Who writes like that!! Wow!! Aww shucks thank you TP. It’s a thrill hearing that from a wordsmith like you! Haha the new bar is going to be hard to surpass. Dickens be damned, I wouldn’t even try. You write such beautiful verses really. Thanks again I am tickled peach that you think that way (big smile).